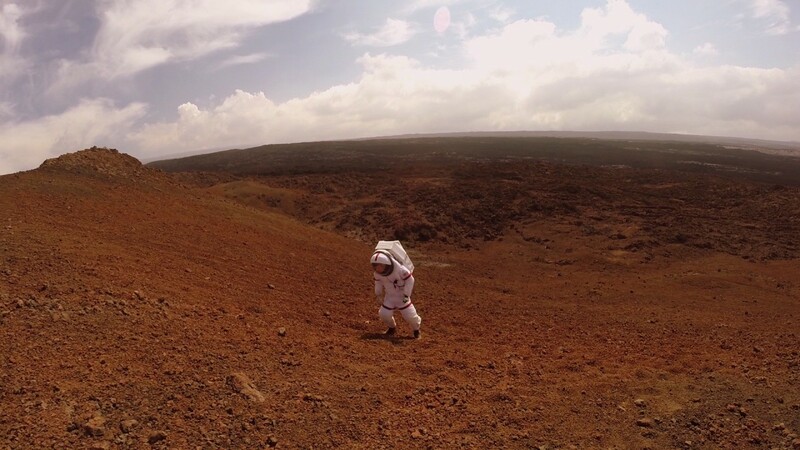 The HI-SEAS project, funded by grants from the NASA Human Research Program, is a simulated Mars habitat located on an abandoned quarry near a collapsed lava tube. 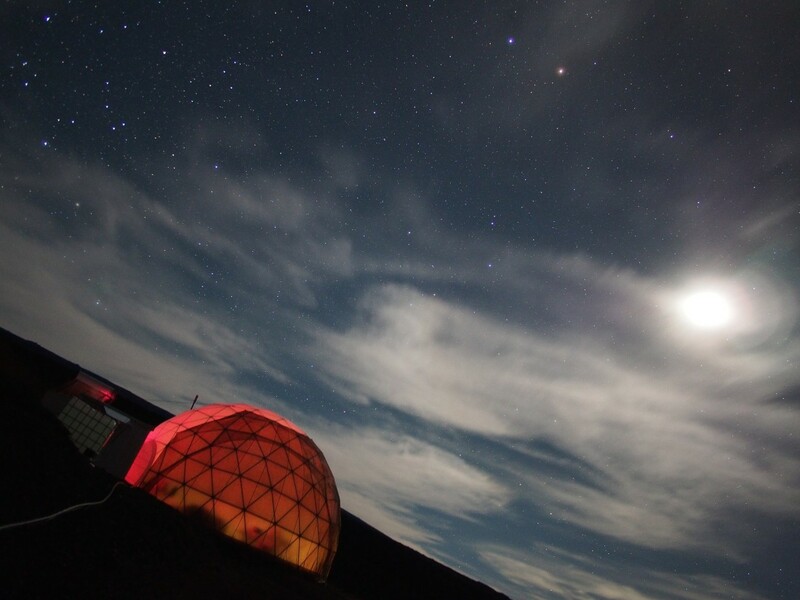 Inside the two-story, geodesic dome’s 146 square meter space, six-member faux astronaut crews advance personal, space-related research projects while partaking in an underlying study of team dynamics and crew cohesion. The second and most recent crew completed its 120-day mission in summer 2014, and a new crew starts an eight-month mission October 15. The one-year mission will begin in 2015. 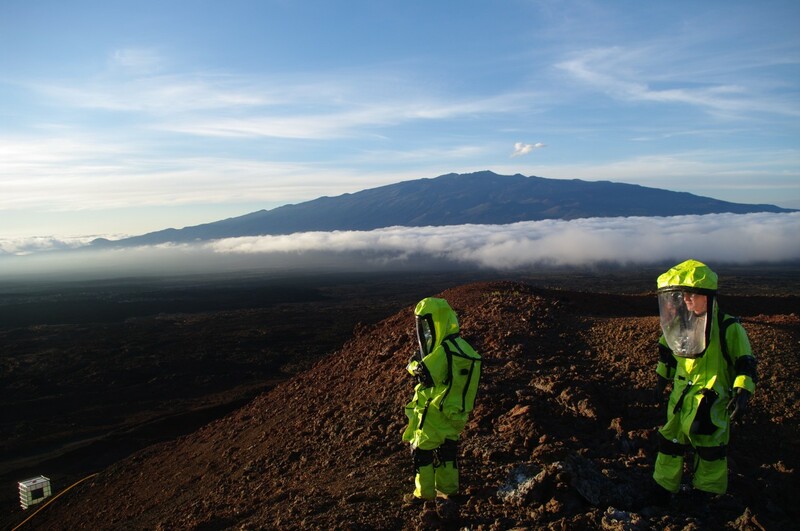 While the first HI-SEAS mission focused on astronaut sustenance, the second mission of the HI-SEAS project studied crew dynamics and cohesion inside the faux Mars habitat (left) in Hawaii, thousands of miles from family and friends (Credits: Ross Lockwood). The crew filled out surveys, wrote in journals, and even wore biometric sensors to combat the ”fine” syndrome and give Binsted and her team insight into the crew’s psychological, physiological, and social wellbeing. “We were always being studied by one method or another,” said Mission Commander Casey Stedman, an officer in the U.S. Air Force Reserve. Crew member Ross Lockwood, a Ph.D. candidate in condensed matter physics at the University of Alberta, said the surveys became increasingly tedious as the mission continued. After all, the surveys were extensive, taking up to three hours each day. “I was pretty unhappy about being asked to fill out surveys right before bed, because that was the time of day where I was the least motivated to do mission-related work,” he explained. Although astronauts on a long duration mission wouldn’t necessarily be required to fill out surveys or write in journals, the crew members believe the monitoring mechanisms used in the habitat did not negatively bias the study overall and actually served the greater mission in and of itself. An essential function of a team is the ability to accomplish tasks together, whether the task is making dinner or fixing a power outage in a high-stress, time-demanding environment (Credits: Ross Lockwood). Repetition is a pitfall of living in space, one inherent to the so-called mission fatigue that Stedman believes serves as the greatest threat to emotional wellbeing and productivity. Apathy and negativity in the highly demanding space research environment can be a costly waste of energy and time—not to mention a dangerous one—and part of the HI-SEAS study is to measure the ways crew members maintain a healthy sense of optimism and motivation. When—not if—demoralizing things do happen, how do crew members effectively cope with negative thoughts or emotions? Swarmer’s morale was tested when she received word that one of her friends back home had sustained an injury in an accident. “My mood was affected rapidly as this was towards the end of the mission, and when I began to have obvious increased frustration I decided it was time to tell the crew as this was beginning to affect them as well,” she said. Above, crew members Anne Caraccio and Tiffany Swarmer use a geo tool on the barren “Martian” landscape. Fieldwork was one of the ways Binsted and her team measured the crew’s overall performance. “We gave them goals, and they accomplished them,” she said (Credits: Ross Lockwood). Swarmer’s hesitation to mention her friend’s accident to the whole crew reflected the overall sentiment of the crew to address problems discreetly so as to not disrupt the mission. He said often, talking one-on-one with someone who could empathize on a particular issue helped lighten an emotional or mental burden. Lockwood added that the best thing a crew member could do for someone who seemed to be having a bad day was to assist in reducing workload or give that crew member extra space and time alone. One of the main challenges came in weathering life’s daily ups and downs, not just the big stuff. Many of the crew members had to develop new coping and de-stressing mechanisms suited to the HI-SEAS environment. “At home when I have a rough day I tend to go for a long run, take my dog on a full day hike, or even put in a funny movie. In the habitat, none of these remedies were as successful, in part due to the isolation and confinement which tended to cause fixation or hyper focus on any little issue,” said Swarmer. Outside of the habitat, Lockwood de-stresses by reading, writing, watching a show, or playing video games. Overall, socializing with the crew members proved to be paramount in revitalizing mood and spirit, with mealtimes the sacred space for cathartic release and community. The crew members had to suit up to leave the habitat, a highly involved process that took hours to prepare (Credits: Tiffany Swarmer). The benefit of exercise for the body’s physical and mental state both on ground and in space is well documented. Humans are generally happier and healthier with exercise, and in space exercise carries a heightened sense of urgency. Without it, astronauts can quickly lose muscle mass and strength. Not surprisingly, Stedman and Swarmer cited a technological fail of the habitat’s treadmill as a serious blow to motivation and morale. The treadmill failure was as illuminating for Binsted and her team as it was stressful for Stedman, Swarmer, and Lockwood, and the other three crew members, Anne Caraccio, Lucie Poulet, and Ronald Williams. Not only did it clarify the equipment’s role in the mental (and not just physical) health of the crew, but it also stressed the importance of improvisation, creative capacity, and teamwork—all critical factors to understanding crew cohesion. Binsted and her team sought to answer questions like: which crew members assume the leadership role in unexpected crisis situations? How effectively do the crew members work together to accomplish a specified goal in a specific amount of time? How well do crew members fare doing repetitive, mundane tasks in a small space? “We were all determined to see the mission succeed, and therefore all of us put that forward of personal interests and research. Our strongest moments were when we faced adversity from factors that threatened the missions, such as systems failures. We worked best as a team when our energies were focused on the resolution of a problem we all faced equally,” said Stedman. In addition to the broken treadmill and a simulated solar flare emergency—when the crew sought shelter in lava tubes from bursts of sun radiation—the crew also weathered other challenges. “Emergency situations were dealt with very proactively. The crew tended to perform very effectively during these times with the most qualified individual taking lead and the rest of the crew taking up support positions,” she said. Casey Stedman, above, emphasized the importance of teamwork in any highly demanding, hazardous occupation—especially spaceflight. “The benefits of having a cohesive and comfortable team prepared before a mission is to launch is absolutely more productive than just collecting x-number of highly qualified candidates into a crew,” he said (Credits: Ross Lockwood). 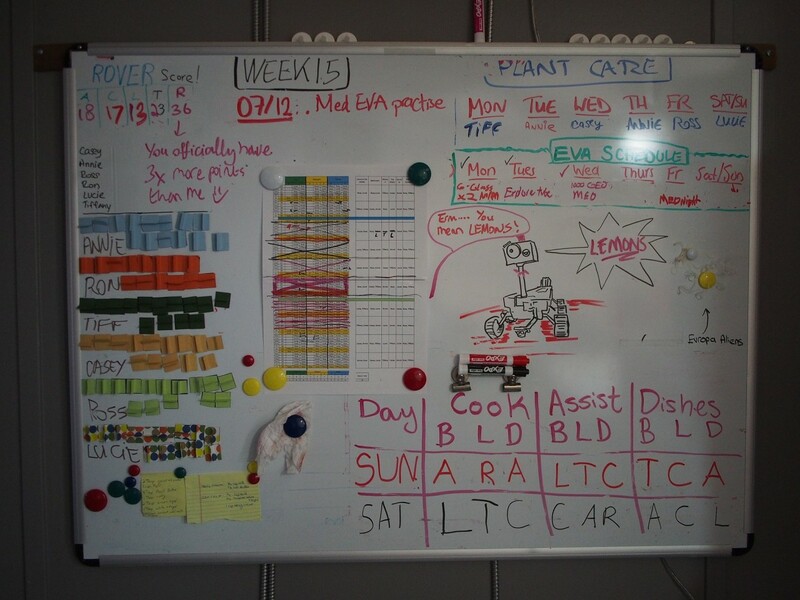 Individual qualifications play a key role in the HI-SEAS habitat and in astronaut crew selection in general. When a team of astronauts is selected for a mission, diversity in skillsets is imperative to maintaining a safe and functional operating environment. The challenge lies in maintaining as little adversity as possible in the face of this diversity. “The variety of scientific backgrounds, training, and education that made us experts in our fields meant we had to learn from and depend on the talents of our teammates. For a small group of highly motivated, confident achievers—type A personalities, if you will—enclosed in a small space, this naturally was a challenge,” said Stedman. He believes finding the right crew for a long duration spaceflight comes down not to picking the best astronauts, but to picking the best team. Binsted and her team—which includes researchers at seven universities across the U.S.—still have hundreds of hours worth of analysis to do on the data they collected both independently and dependently of the six crew members, and during the next two missions they will continue to observe how physical space, personality and circumstance impact crew morale and cohesion. 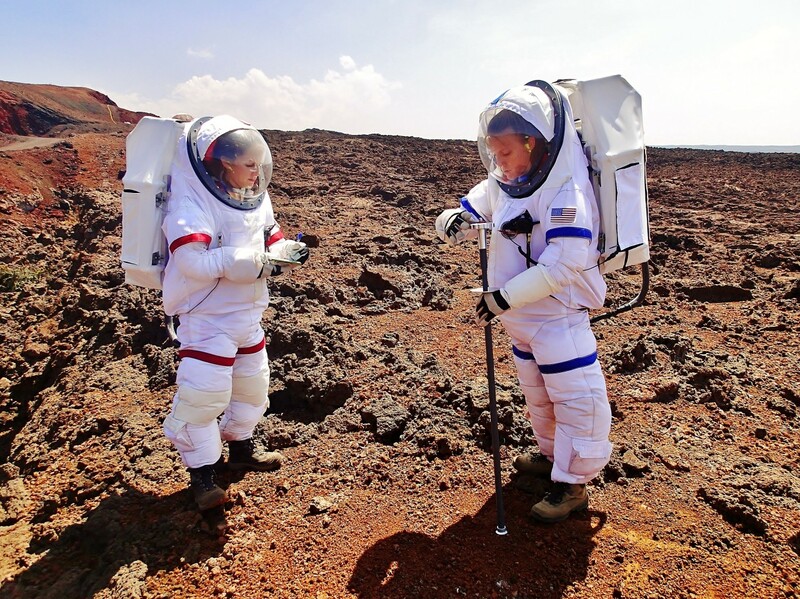 The more the researchers discover about subtle changes in the participants’ moods, bodies, and performance, the more likely they are to prepare interventions to keep future astronauts healthy, safe, and motivated, for Mars and beyond. It will take an actual Mars mission to prove that the human spirit can endure and conquer this frontier, as it has others. Let’s just hope the treadmill works.